A major concern for some, myself included, was that this re-boot would beat the all too familiar origin story to death. Thankfully director Marc Webb (500 Days of Summer) and the film’s three writers aren’t in a rush to hit all the famous beats in one sitting, nor to do them in the same manner as the comics or the Sam Raimi trilogy. Where Raimi saw a story full of slapstick gags, Marc Webb keeps the characters and their relationships in the crosshairs. There’s no way Webb would have such a strong film on his hands if it weren’t for his cast. A supporting cast that includes Martin Sheen (Uncle Ben), Sally Field (Aunt May), Denis Leary (cantankerous Captain Stacy), and Emma Stone as Parker’s first love, blonde Gwen Stacy, gets you off to a grand start. Having Andrew Garfield star as the awkward high school photographer is like adding the baking soda to the vinegar. Garfield is never disconnected from his high school character’s mannerisms or emotional textures, both of which were unfortunately distracting during Mr. Maguire’s tenure in the tights. Finally, getting Stone and Garfield together on the screen is the perfect match, as they have both mastered the charming earnestness of young intellectuals (see Stone in Easy A). Their chemistry is palpable, buttressing other emotional areas that have a few potholes. 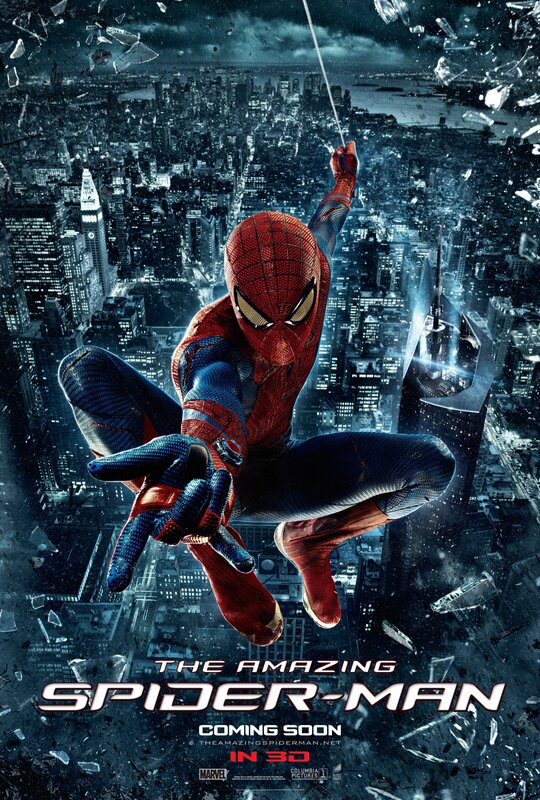 What really makes this film amazing is the different approach to filming the special effect-driven life of Spider-Man. The original trilogy consistently had the colorful sheen of CGI surrounding the swinging spidey, and though the subway fight sequence in Spider-Man 2 still stands as one of the best of the genre, CGI didn’t make the trilogy feel believable. In The Amazing Spider-Man you’re going to see a lot of stunts and it’s going to be very difficult to discern what’s real and what’s digital wizardry. As Parker escapes from a gang of alley goons, he busts out his parkour skills to scurry, flip, clip, and contort around the urban environment; or as he swings around the city, a lot of it is a guy actually dangling from a wire in the city (you can see some of the behind the scenes footage here). With the practical effects taking a starring role, when The Amazing Spider-Man does bust out the computer special effects toolkit, it’s stunning to watch. As Parker webswings through Manhattan the speed, momentum, and acrobatics are all the more stunning against the backdrop of New York at night (the original trilogy seemed to take place during the day most of the time). The Amazing Spider-Man crew were obviously inspired by the 40+ years of Spider-Man comic covers, bringing them to life by allowing spidey to take some of his iconic poses in slow motion. These little moments allow you to relish a single thought: What this guy is doing is really frakking cool. Nearly all films have their issues, and The Amazing Spider-Man isn’t without its share: Peter’s relationship with his Aunt and Uncle feel unfinished, and the last few scenes (including one after the first section of credits) are frustratingly nonsensical (all of which could be due to some alleged last minute cutting). Toss in some terrible product placement (everyone in my theater laughed as this tech savvy teenager used bing to look up info on his parents) and it’s not without the occasional hiccup. The main reason to see Amazing Spider-Man, though, is that Webb and his star Garfield have given us the first teenage hero of this generation. Just as the Ultimate Spider-Man comic was supposed to do, this re-boot (and the look and feel of its star) is connected to the world of teenagers, both in terms of technology and day-to-day struggles. This version of Spider-Man has real troubles that feel solidly connected to our own lives, not a fictional reality. Updating the world of Spider-Man to reflect more reality and less superhero glitz wouldn’t have happened without The Dark Knight, but for other reasons than what you’re used to hearing. “Dark” and “gritty” are adjectives frequently attached to The Dark Knight, the first superhero film that went for Greek tragedy instead of feel good summer pop. But it wasn’t just about some visual aesthetic or weightier drama – it was about taking superhero films out of fantasy and bringing them into drama. Fantasy, by definition, is outside of our world, and the first superhero films were deeply entrenched in the world of movie magic, far from the day-to-day grind we’re all going through. Though Amazing Spider-Man does have a similar color palette to The Dark Knight, the real connection is that The Dark Knight paved the way for Marc Webb and Co. to dig deeper into the Peter Parker mythos by bringing it into our world. It just makes it that much richer when the comedic or the dramatic hit characters who could exist in our world. We all need to be on our guard against cynical grabs for our recession dollars, but The Amazing Spider-Man is worth witnessing on the big screen. They’ve truly brought this beloved comic to life. This entry was posted in Reviews and tagged Amazing Spider-Man, Andrew Garfield, Denis Leary, Emma Stone, Film, Marc Webb, Martin Sheen. Bookmark the permalink.